Apparently, smartphones and the Internet are more key to the good life than anything the US Supreme Court passed in the last 50 years. 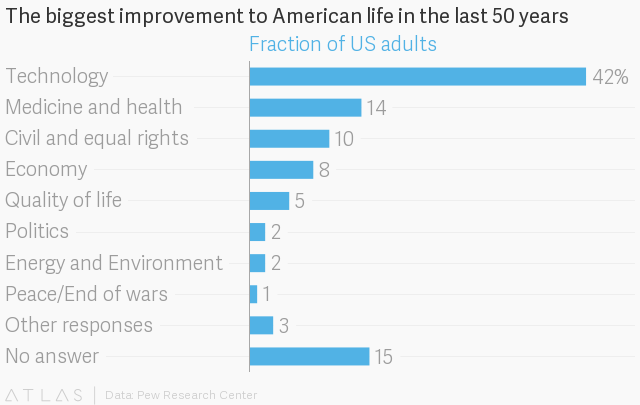 According to a Pew Research Center study fielded this summer, 42% of US adults credit the biggest improvement in American lives to technology, more so than medical advances, expanding civil rights, or the economy in the last half-century. In addition to the silicon revolution that led to the personal computer and the iPhone, this time period includes innovations like artificial organ transplants, that have led to steadily declining mortality (pdf). This view, however, was somewhat differentiated by race. White Americans were most likely to identify technology as the biggest improvement to life (47%), followed by Hispanic respondents (35%). Black respondents, perhaps unsurprisingly, put technology (26%) almost on par with civil and equal rights (21%). Another Pew survey found that, aside from the Sept. 11, 2001 attacks and Barack Obama’s presidential victory, the technology revolution was the most historic event for many Americans, beating two major wars, the fall of the Berlin Wall, and the passage of gay marriage. What’s more, more US adults also believe technology will bring the biggest improvement to their lives (22%) over the next 50 years, more than anything else. While access to the Internet is not yet universal for Americans, its use has steadily risen. Smartphones are also ubiquitous: By 2020, 80% of the adult-population worldwide is expected to have one.